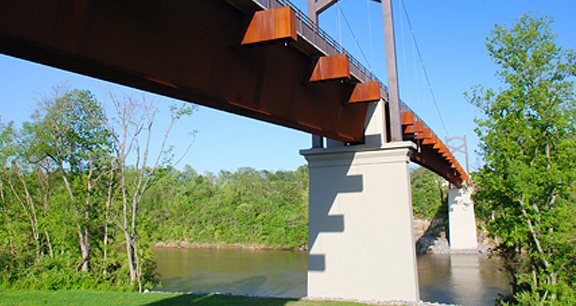 Project obstacles and solutions: The Cumberland River Pedestrian Bridge connects two greenway areas: Nashville’s Shelby Bottom greenway with the Stone River greenway. The bridge measures 745 feet in length and is a suspension bridge designed to accommodate walking, running and biking. It is suspended 90 feet above the Cumberland River. Bell and Associates had some unique constraints that made this project noteworthy. The Cumberland River is a thoroughfare for barges and the shipping lanes of the river could not be impeded. Secondly, due to the spans, the beams had to be counterweighted with more than one million pounds of concrete on the shores to provide the strength to allow the bridge to span without any piers. IMI was able to supply both the counterweight materials and the concrete for the bridge itself. The beams were brought to the site by barge, and lifted into place by cranes on barges. The bridge deck was poured in sections from one side to the other. IMI supplied both regular and lightweight concrete to balance the weight of the two sides. The two spans had to be formed and placed precisely for the bridge to meet in the middle. Structurally, physically and logistically this was a very challenging project that required great contractors and great suppliers. The bridge won the Tennessee Concrete Association 2009 Best Architect / Engineer Non-Building structure as well as the Award of Excellence from Associate Builder and Contractors and was named the Best of 2008 Award from South Central Construction.